This dual WiFi smart socket provides you with surprisingly smart and simple life. Using a smart WiFi outlet, there is no place and time limit. Control home appliances anytime, anywhere. 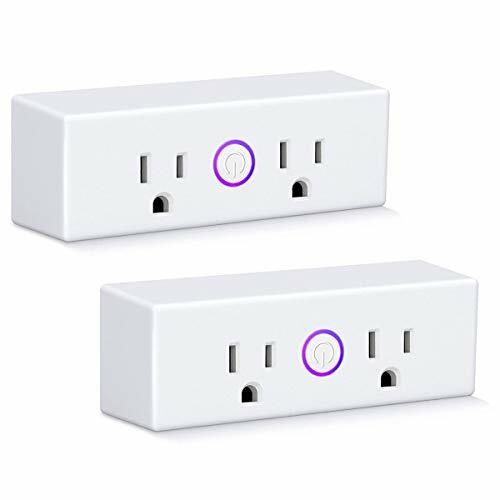 Mini size, double outlet Space-saving design, CNLive.com mini smart plug will not block the entire socket. Easily install two Minis in a single socket for fun and double sockets to make your life easier. CNLive.com smart outlet can help you automatically turn on/off the home appliance by setting a schedule or setting a timer.. Efficiently conserve energy and save money. Set up a timing plan Never go home to a dark house. Arrange heated water before arrival. Or turn off your TV when your child goes to bed. NOTEplease check the two outlets' names in your app/software first. Only when the outlets are differently named, they can be controlled seperately.